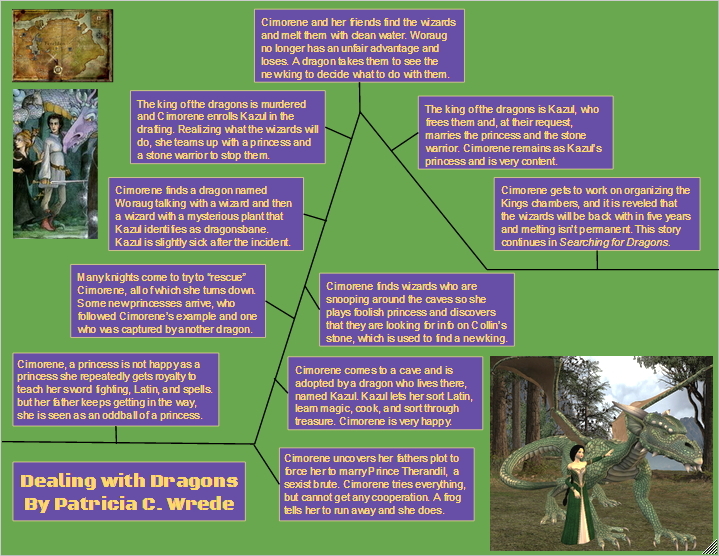 As my outside reading book for English class I read Dealing with Dragons by Patricia C. Wrede and made a plot diagram for it. I enjoyed this book a lot and plan on recommending it. This book was about a princess named Cimorene. She doesn't want to spend her life as a princess though. She thinks embroidery and etiquette are boring, so since the age of eight she has been trying to educate herself. She convinced the master of arms to teach her swordsmanship, which was stopped by her father because "it just isn't done!" She then tried to learn Latin, then cooking, and when that was put to an end, sorcery. The king of Linderwall and Cimorene's father finally sent her to Prince Therandil a sexist, stupid prince in order for her to be "properly educated in her role of things." Talking to her maids, she discovers that her father is secretly having them married. When she goes to talk to him she is infuriated. He refuses to give her any choice in the matter. She talks to Prince Therandil who doesn't want to marry her, but his father was bribed into it. They talk for a while, but he is such a block head that they don't get anywhere. Taking the advice of a toad (who picked up the trick of talking because he was friends with a toad-prince) Cimorene runs away to a cave and meets a group of dragons. She decides that she wants to live as the princess of Kazul a female Dragon looking for someone to sort through her library of Latin scrolls and spells, keep her tunnels clean, and cook for her. Cimorene loves this and has a great time. Knights keep coming to rescue her but she turns them all down. Among all this, wizards start showing up by the dragons caves, witch they had a pact not to do. Then the chief wizard starts looking for information on the caves of fire and night, and is then seen collecting dragon's bane. Two days later the king of the dragons is dead. What will happen now? 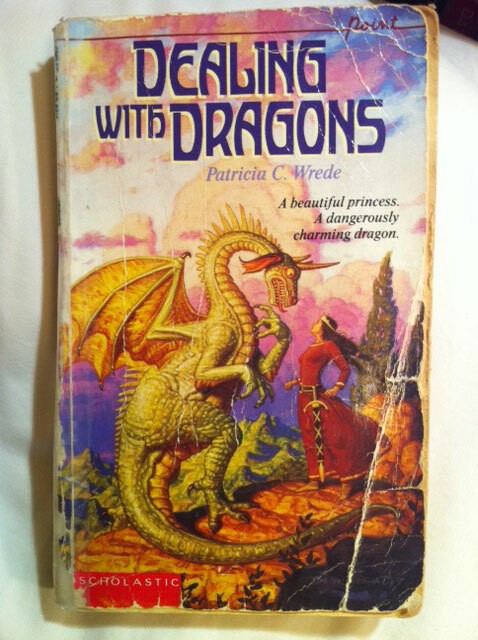 I liked reading this book because it was a parody of the sexist princess captured by a dragon story.